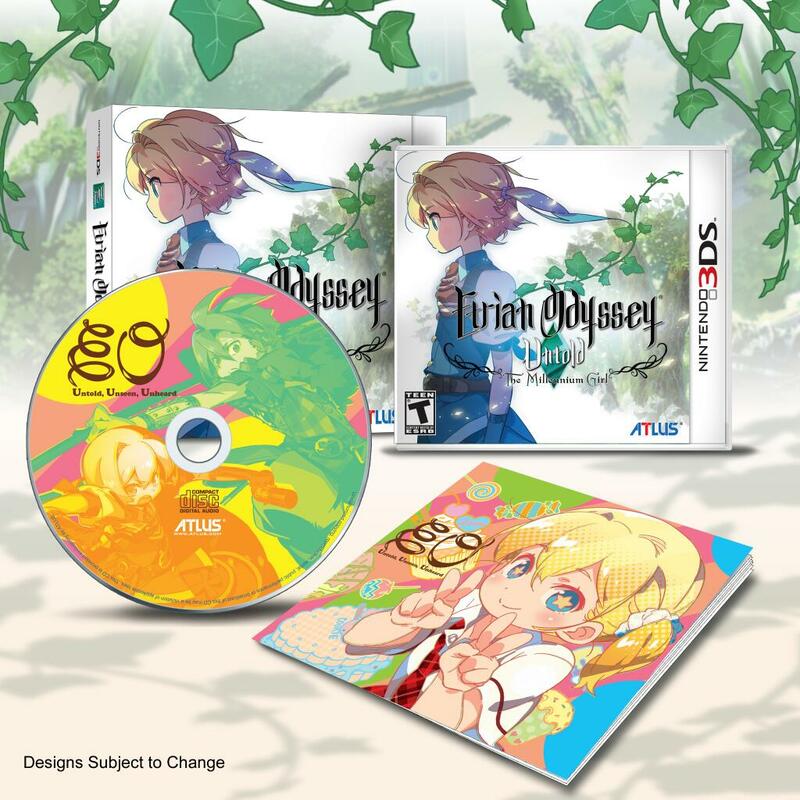 Irvine, Calif. – Aug. 8, 2013 – Etrian Odyssey Untold: The Millenium Girl, the latest edition of the map-making, labyrinth-crawling Etrian Odyssey RPG series is getting a collection of pre-order bonus items called “Etrian Untold, Unseen, Unheard.” The collection will include a 7-track music CD which features an exclusive live version of the game’s opening theme, an exclusive rough sketch version of the same, and other songs, arranged by series composer Yuzo Koshiro. It also includes a design book containing character art, comics and notes. Exclusive to the Nintendo 3DS system, Etrian Odyssey Untold: The Millennium Girl will be released in stores and the Nintendo eShop simultaneously on Oct. 1 for $39.99. More details can be found on the game’s official website. Etrian Odyssey Untold: The Millennium Girl (EOU) offers two full length experiences: The expanded story mode takes players on a journey to unravel the mystery of the Yggdrasil Tree’s origins, and the classic mode updates the original Etrian Odyssey with new dungeon layouts and challenges. Both versions feature the same gameplay conveniences, updated 3D graphics, and StreetPass abilities as in Etrian Odyssey IV. The story mode, a first for the series, gives players five pre-made characters, each with their own personalities and dialogue to explore a side of Etria not seen in the first game. Gameplay is interspersed with animated cutscenes by MADHOUSE animation, and with more than 3,000 lines of dialogue, voice acting, and more. The chart-making mechanic Etrian Odyssey games are renowned for returns, along with first-person dungeon exploring and intense, turn-based combat in new dungeon layouts. EOU also brings new difficulty modes, which can be changed at any time: “Picnic” and “Standard” mode are for players new to RPGs or the Etrian Odyssey series, while “Expert” adds new challenges for veteran adventurers. Etrian Odyssey Untold: The Millennium Girl releases exclusively on the Nintendo 3DS system for $39.99 and will be available simultaneously in retail stores and in the Nintendo eShop beginning Oct. 1. The box set will be available for pre-orders and the first printing of the game after launch. The game is rated T for Teen by the ESRB. For more information, including updates on the game, please visit the official website at: http://www.atlus.com/untold.